Truth be told – I am an evangelist for Cooks Illustrated magazine. If you’re not familiar with this culinary publication and it’s companion public TV show America’s Test Kitchen, I strongly suggest you check them out. Whether you’re an experienced cook or a complete novice, I guarantee you will find useful information in just about every article you read or episode you watch. 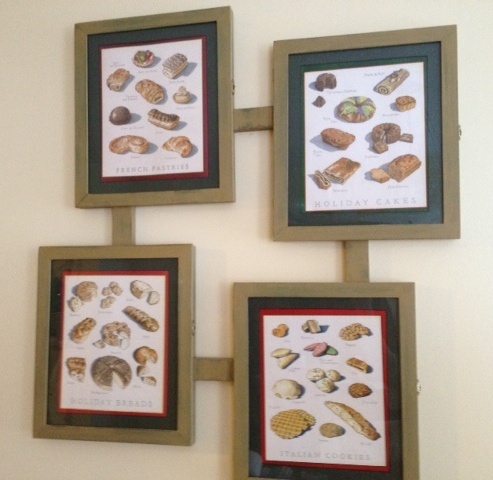 I am such a die-hard fan that my husband had a special frame made for me so I can display the artwork on the back of each magazine and still be able to keep the magazine in tact and pull it out when I need to. Each panel of this custom frame has a door on the front so I can switch the magazines out when I want to use the recipes. I have a five-year collection of Cooks Illustrated magazines and I flip through them frequently. As a media company, these folks follow a philosophy and mission to help educate the home cook about how to create delicious and beautiful food by debunking the mysteries and taking some of the guesswork out of the process. They experiment with recipes, techniques, products and equipment and make recommendations based on their exhaustive research and the results of their thorough testing. I have absorbed an immeasurable quantity of information from reading this magazine and watching this television show. No matter how good I think my cooking is, I always find some tip or suggestion that makes my preparation just a little bit better. And even when I disagree with their conclusions, I respect the process they’ve employed for testing every variable. When I learned that America’s Test Kitchen was rolling out a public radio version of their television show, I got extremely excited. You see, I work in public radio. Being such a huge fan, I figured my feedback might be helpful as they begin developing this new venture. Since the first of this year, they’ve been producing pilot shows and asking a group of people like me to help guide their production. I found out who was responsible for producing this new show and I inserted myself into the process. Last week, this group of public radio programming folks were invited to Boston to spend the day at America’s Test Kitchen, meeting their staff, getting a behind-the-scenes look at how they make their magic happen and offering feedback on the programs they’ve produced so far. The gathering started the night before with a private dinner at one of Boston’s most exclusive restaurants Menton, a five-star five-diamond establisment. 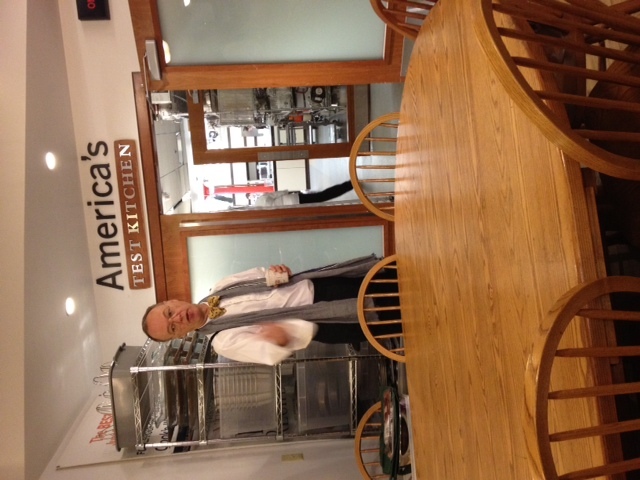 As the group filtered in, we were greeted by Christopher Kimball and Bridget Lancaster, the stars of America’s Test Kitchen. Christopher is the creator and guiding force behind this small yet mighty media empire. Bridget is an on-camera test kitchen expert whose charming personality and excellent skills make the TV show so inviting. I have to admit, I was a little star-struck and tongue-tied by meeting a couple of my culinary heroes. But half way through a glass of fine single-malt scotch and a great conversation about baking bread, I relaxed a little bit and was ready to enjoy an amazing dinner. After scrumptious tidbits of steak tartare on tiny potato chips, mini lobster BLT’s and bacon-wrapped dates with blue cheese, we sat down to dinner. 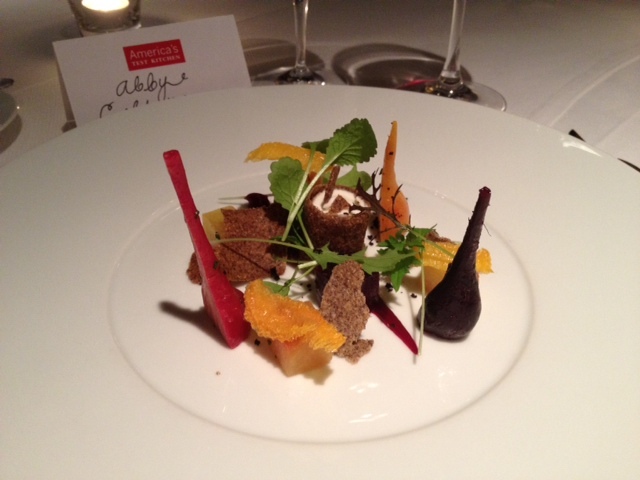 My first course was a beet salad playfully constructed on the plate with little seeded tuiles, petit segments of citrus and little dollops of goat cheese. Each bite was a perfect marriage of flavors and textures, the sweetness of the beets, the tangy pillows of goat cheese and the delicate, savory, crispy wafers of the tuile. For my second course, I had a perfectly cooked medium rare piece of ribeye steak. I could see the thin ribbons of fat lacing through this lucious section of beef and each tender slice delivered a burst of beefy flavor. It was served with pieces of caramelized spring onion and a potato and cheese puree that was rich, starchy and creamy. These sides were a great backdrop for the beef, adding texture and flavor without taking over the focus of the dish. I was tempted to lick the plate. 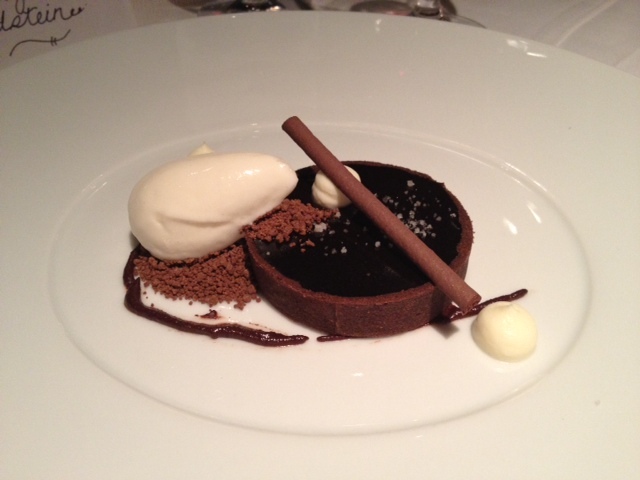 For dsessert, I ordered a chocolate tart. I’m not completely certain what each component on the plate was, but they were all delicious. The chocolate tart had a hard shell filled with decadent mousse and a dark chocolate layer on top sprinkled with sea salt. Nestled on the side was a scoop of rich vanilla ice cream resting on a pile of what tasted like malted chocolate powder. I’m not sure I have the words to decribe the sumptiousness of this dessert. I floated home on a cloud that night, filled with anticipation for the next day’s adventure. 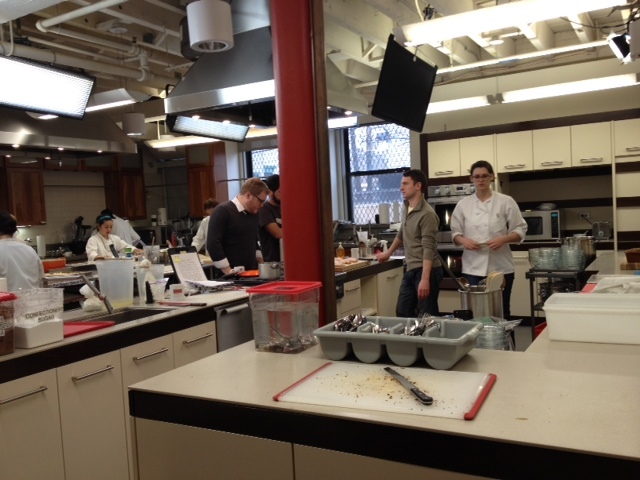 The following morning, I arrived at the test kitchen facility in Brookline brimming with optomism. It’s almost impossible to find, tucked away in a quiet area of the Boston suburb in an unmarked building. The top floor where the magazine is produced is a warren of offices and cubicles.We gathered at a huge wooden table and Christopher explained how the editorial process works, ideas circulated around that very table, debated, argued, assignments made and updates shared. The morning began with coffee and blueberry buckle, prepared by the test kitchen chefs. We discussed the agenda for the day, the made our way down the spiral stairs to the level where the actual test kitchens live. So, this is where the magic happens – on the lower level of this unassuming building. It does not look at all like it looks on TV. I imagined a slick, spacious studio setting, with lots of room for video cameras and high-tech lighting. But this is a working kitchen, with rows of cooktops and counters lined with ovens and sinks along the walls. It was buzzing with activity, every cooktop was being occupied, every bit of counterspace was being used to test some gadget or tool and a still photographer was moving a stepladder around so he could get good shots of the various stages of different dishes. 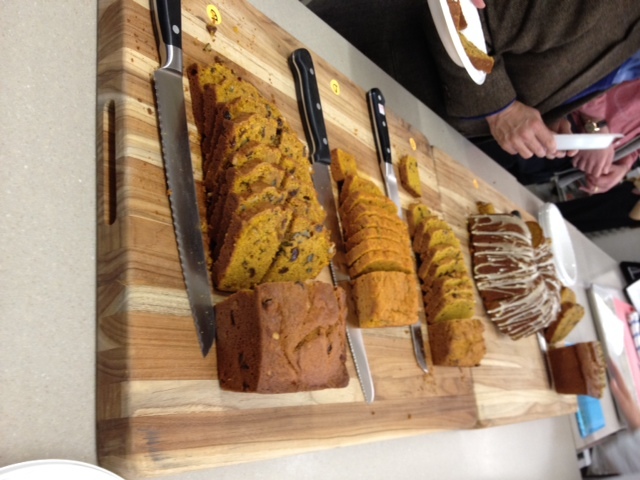 We were ushered to a countertop where multiple preparations of pumpkin bread were layed out for us to taste. Our group gathered around and piled slices of each sample on our plates, then tasted and discussed the merits and shortcomings of each pumpkin bread. As we moved through the kitchen, were introduced to test cooks who were preparing duck confit and potato latkes and testing rolling pins and wooden spoons. We met with a young lady who was testing blenders by using them each to crush ice. She had a decible meter that she was using to measure how loud each blender was. She explained how long it will take (months) to complete this test and how many different experiments these blenders will be put through before they can be properly rated. As we moved along through the kitchen, the journalistic process that is employed every day to publish this magazine became clear to me. Sometimes a recipe will be prepared fifty times with slight variations each time to see how it effects the final dish. After the tour of the kitchens, we went back upstairs to the big wooden table, where we were presented with a tasting of dark chocolate and invited to go through the same process that their staff goes through when they rate products. 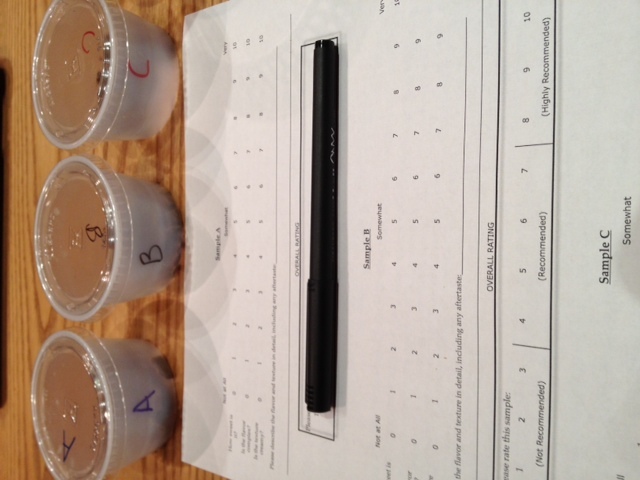 We tasted each sample in silence and wrote down our observations on the same form they use. We spent the next hour and a half offering our feedback on the radio show and talking about how the mission and philosophy of Cooks Illustrated translates into the presentation of audio content for a public radio audience. It was a brisk exchange of expertise and I have a new-found appreciation for the work that these smart and focused people do every day. Finally, even though we ate at each stop throughout the morning, we finsihed our meeting with a late lunch at a local eatery. Once again, I floated home feeling pleased that two of my passions, food and public radio, had come together in one amazing day of exploration. I'm a broadcast professional and home cook who loves music, travel and exploring unique, distinctive things, places and ideas. I love to cook, discover new flavors and improvise in the kitchen. This entry was posted in Product review, Restaurant Review, Uncategorized and tagged America's Test Kitchen, Cooks Illustrated, Cooks Illustrated magazine, Menton. Bookmark the permalink. I can’t believe you got to do this. OhmygodI’msojealousofyou!!!!! It was a fabulous experience – now, when I watch the show, I can say “I’ve been there”.